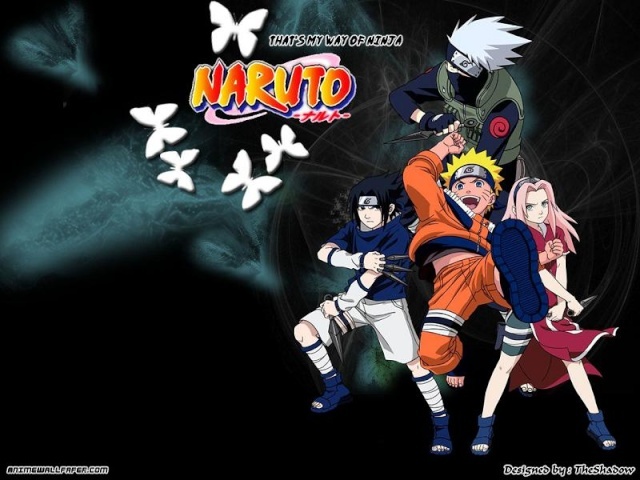 Sometimes ninja in the world of Naruto will band together to form a specialized group or teams. Often the members will share unique traits or abilites. These range from the elite guards of Orochimaru, to the ninja playgroups of young Ninja Academy students. Akatsuki breaks its members into two-man partnerships to have them explore the world, collecting new jutsu and information on jinchuuriki. Akatsuki members Deidara and Sasori work together and are known for being artists. Deidara uses clay to model his explosive animals and Sasori is a master puppet maker. Deidara acts as the junior in their partnership, defering to Sasori as the stronger ninja. This does not stop them from getting into spats about the nature of art though. Akatsuki breaks its members into two-man partnerships to have them explore the world, collecting new jutsu and information on jinchuuriki. 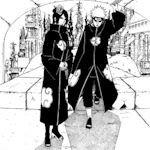 Akatsuki members Deidara and Tobi work together. Deidara uses clay to model his explosive animals; Tobi's jutsu are currently unknown. 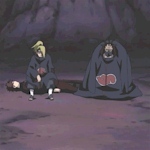 Deidara acts as the senior in their partnership. Akatsuki breaks its members into two-man partnerships to have them explore the world, collecting new jutsu and information on jinchuuriki. 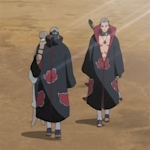 Akatsuki members Hidan and Kakuzu work together and share a somewhat testy relationship. Hidan follows a very strict religion, which annoys Kakuzu with its long rituals. Hidan is very defensive of the religion, causing Kakuzu to often get tired of his partner's diatribes. Akatsuki breaks its members into two-man partnerships to have them explore the world, collecting new jutsu and information on jinchuuriki. 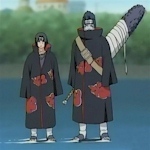 Akatsuki members Kisame and Itachi were placed together. Itachi is one of the last surviving members of the Uchiha clan and Kisame is a former Seven Swordsman from Hidden Mist. Akatsuki breaks its members into two-man partnerships to have them explore the world, collecting new jutsu and information on jinchuuriki. Akatsuki members Pain and Konan work together. They appear to have a close relationship and seem to be the only two members to know the truth about the group's true plans.